Having lunch at The Penthouse at The Huntley was a no-brainer. Inside and out, the property is exquisite and fancy. Chic, modern, and clean, the food was almost out shined by the beauty of this property. Typically, I would not choose such a fancy, and such a far place. Fortunately, the Dine LA menu was hard to pass up. Once I entered the roof top property, which should be the “penthouse” of the hotel, I was shocked at the view. from almost every window, you can see the ocean or Los Angeles. Luckily, I was seated at the corner where I had views of Downtown Los Angeles and the Pacific Ocean. It was such an amazing view as I enjoyed my lunch. Even though we had reservations, we needed to wait for our table at the bar. It may all be part of the business, but I feel like restaurants make patrons wait at the bar so that we buy overprices drinks. Well, call me a sucker. I was bored and sat at a bar. Naturally, I ordered a cocktail. Not having breakfast made me yearn for some coffee. 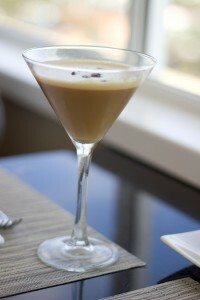 In hind sight, ordering the coffee liqueur cocktail was a mistake. The coffee taste was there, but the aftertaste of the sour alcohol was not pleasant. I love coffee in the morning, but I like it rich and full bodied with no signs of sourness. To me, sour coffee is a sign of spoilage, and this cocktail being sour was not for me. We started things off with the young romaine. 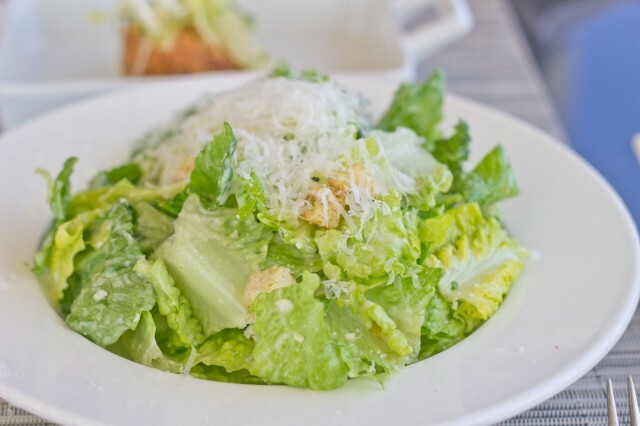 Chopped romaine dressed with a lemon caper dressing was topped with shaved Parmesan and sourdough crouton. The salad was nothing special, but the lemon caper dressing was better than expected. A bit on the boring side, I was left wanting some color and vibrance from the dish. The crab cake here is not traditional, only because it is amazing. 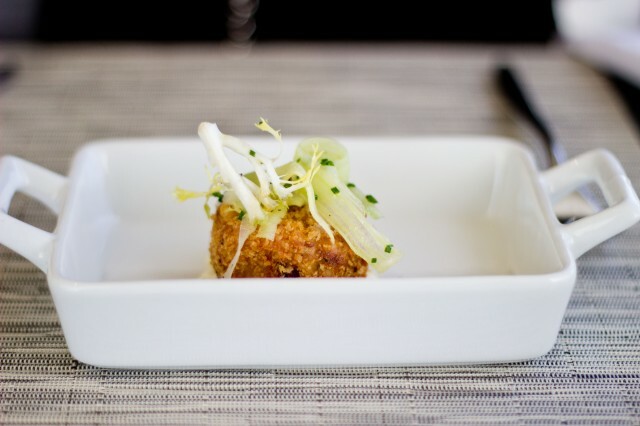 Most crab cakes are mostly filler — eggs, bread crumbs, veggies, etc. Their was nearly 100% crab meat. Cutting it with the fork, all that was inside was crab meat — no bread crumbs or filler, and not even mayonnaise. Though the breading on the outside didn’t have much of a crunch, the celery salad and remoulade sauce made up for it. Only if all crab cakes had all crab in it, I would order it more often. Theirs was surprisingly as advertised — all crab meat. 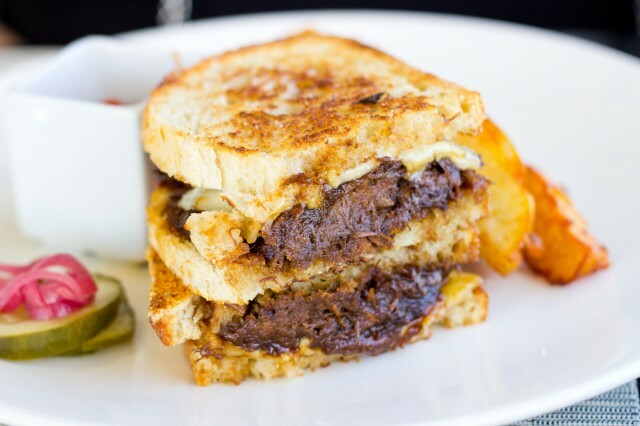 For the entree, my choice was the grilled cheese with short rib. This sandwich was full of flavor. The short rib was juicy and flavorful from braising in red wine. The sourdough was toasted to a crisp and a perfect bread choice. The choice of cheese was the best and spoiled me. The chimay grand cru was delicious and creamy, almost a perfect cheese for a sandwich like this. 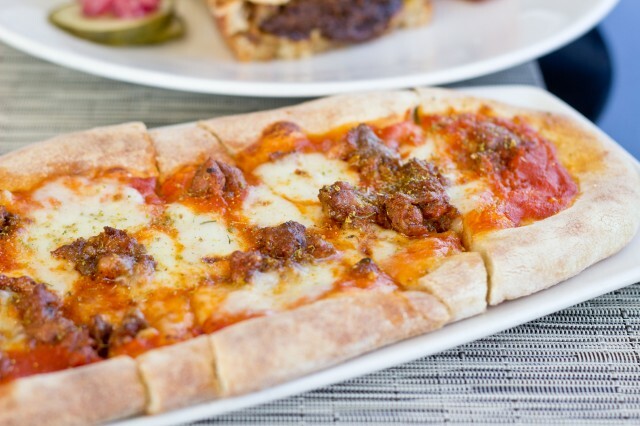 The fennel sausage pizza was also a favorite. Topped with tomato sauce, fresh mozzarella, and housemade fennel sausage, the pizza was surprisingly good. The crust to me is the most important factor of a pizza, and theirs was quite nice. Not necessarily the best, but it had a nice chew and aroma. My favorite part of the pizza was the housemade fennel sausage. It wasn’t too salty or oily. It had a nice meety flavor with a lot of aromatic fennel. 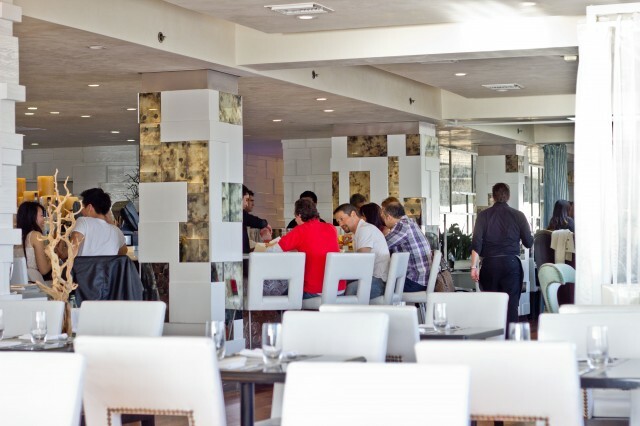 Dine LA is all about 3 courses or more. That meant, dessert was part of the plan. I opted for the profiteroles, though I wish I had great remorse. It’s not that it didn’t taste good, it was just that it was uninteresting and the other chocolate sweet savory dessert would have excited me a little more. 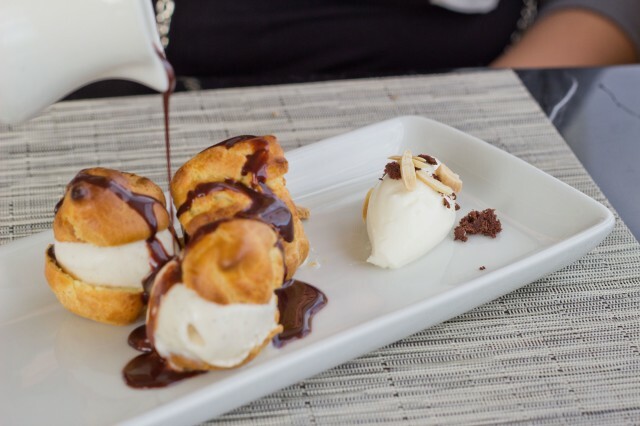 The profiteroles were filled with a delicious vanilla bean ice cream though, which kind of saved the dish. The best part was the hot fudge sauce drizzle. It all came together to make a tasty dessert. Their vanilla creme brulee was good, but again, boring. 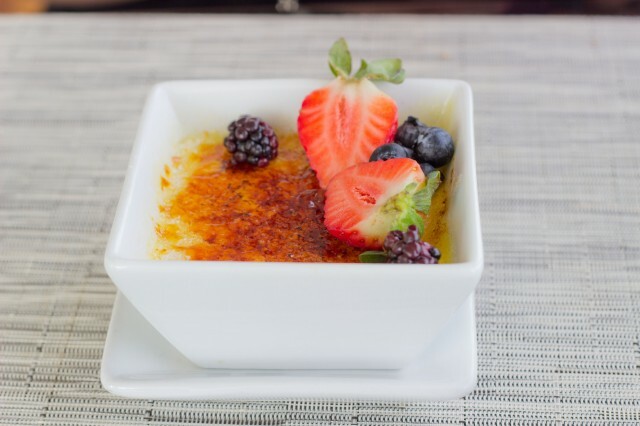 I don’t know how many times I order the creme brulee for dessert, but I always have it. Maybe its the creamy custardy inside or the burnt sugar candy topper. The fruit in their creme brulee was a nice touch. This dessert was boring, and not of any fault of their own. My over stimulated taste buds yearned for something different — I just didn’t order it. Overall though, I was happy with our dessert choices. 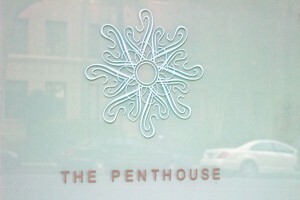 Lunch at The Penthouse was a fun experience. Not only was the property amazing, the food was impressive as well. Hanging out at 3rd Street Promenade was a must after lunch. The beach and sun was all an acompaniment to our full bellies. 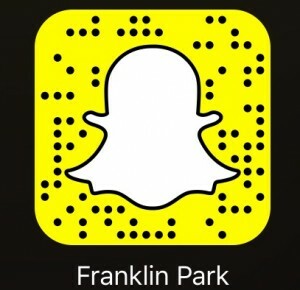 Below is a short video of the elevator ride down. I don’t know what it is about elevator rides, but if it’s got an awesome view, I have to capture it on video. Anytime you are in Santa Monica, you must make a stop at The Huntley. The near 360 degrees of ocean, beach and Los Angeles is hard to pass up. Previous post: Dine Delish Turns 2!